Believe it or not, Christmas is a mere ten days away! Eek! I am like a little kid when it comes to Christmas... there is something so magical about this time of year. And with four holiday parties in the next three days, a short work week ahead of me and a weekend at my parent's house welcoming Santa down the chimney, I've got a lot to be excited about!! 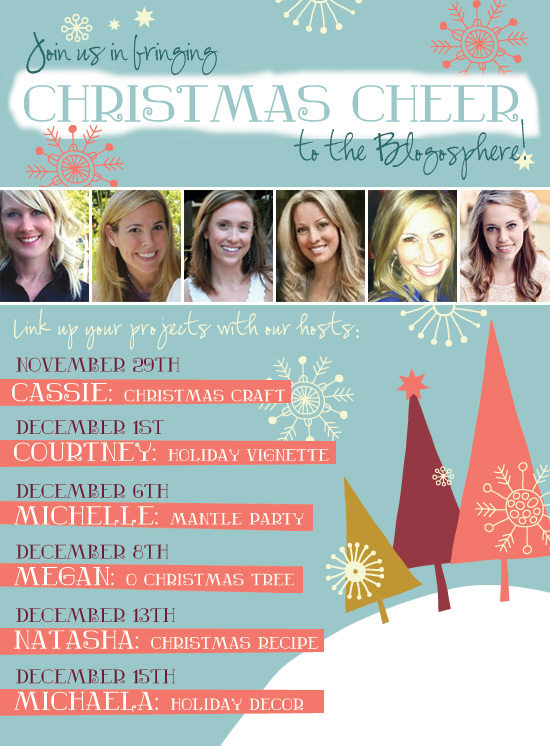 Today, Michaela is hosting a holiday decor link up party as our last link up in the Christmas Cheer in the Blogosphere party. I thought I'd use it as an opportunity to share all of the decor we've got around our place. 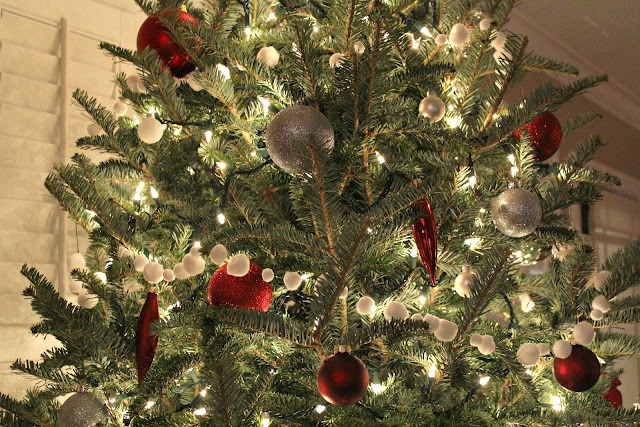 So grab a hot toddy and some gingerbread, and welcome to Christmas at Ten June! 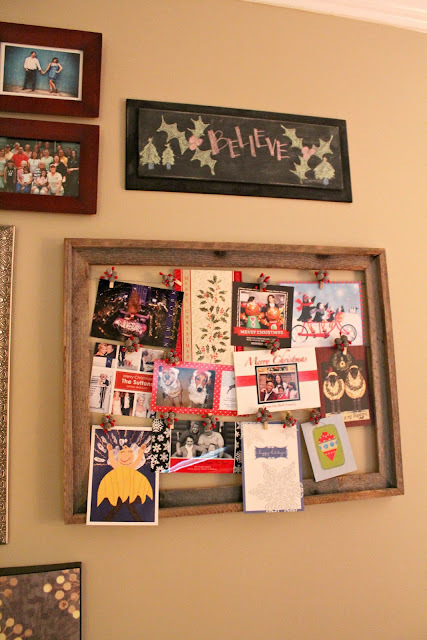 Over on my new gallery wall, I used my DIY clothespin art as a Christmas card holder! I simply wrapped these little pinecone wire ornaments (Hobby Lobby) around each clothespin for a holiday inspired theme. 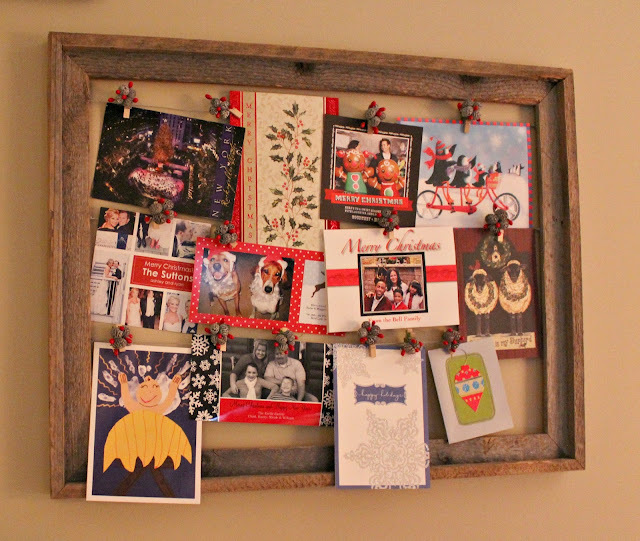 I actually pulled a few of my favorite Christmas cards from last year to help fill up the frame for pictures. I love looking back on old Christmas cards! And yes, that is Tucker and Maggie dressed up like Santa. It happens. Above the cardholder, you can see my DIY chalkboard is all dressed up for Christmas. 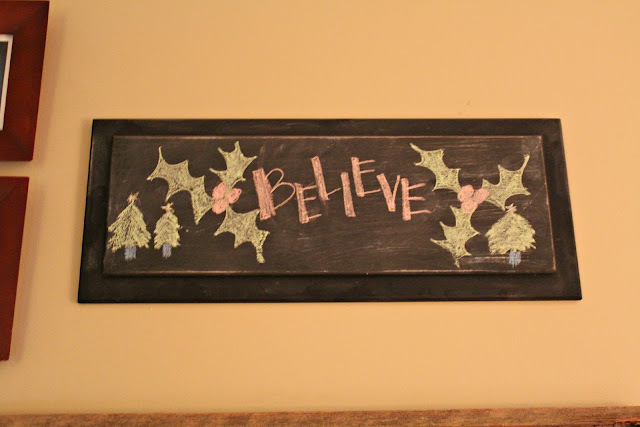 The simple phrase "Believe" really captures the magic of Christmas, don't you think? You can see that our front door and the front of our house is decorated with wreaths on each window. Here's a shot from last year's Christmas house tour. Minus a minor crooked ribbon disagreement (wink wink hubs), the wreaths look the same this year. 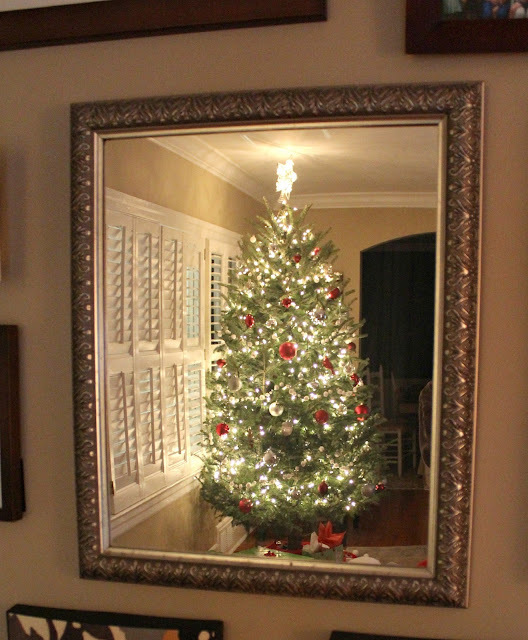 You can also see our Christmas mantel in the mirror on the gallery wall! I love this year's classic red + white theme. 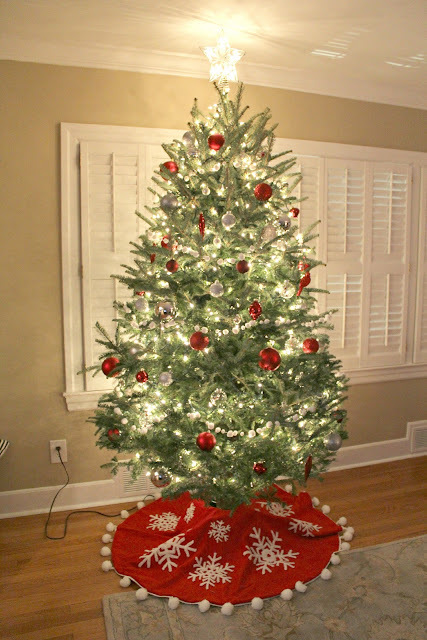 You can also see our Christmas tree with its red + white + silver ornaments and DIY pom pom garland. What a fun shot. The whole living room is decked out! Can we all just take a moment to oogle at how fabulous my all-white painted plantation shutters look? Makes momma happy. 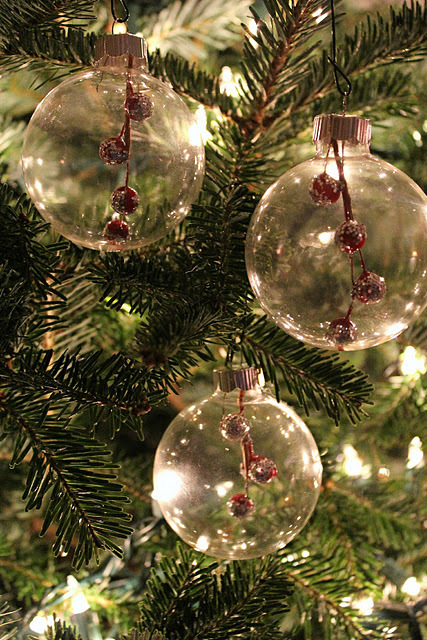 Oh and don't forget my DIY cranberry glass ornaments on the tree. I love how sparkly they are! 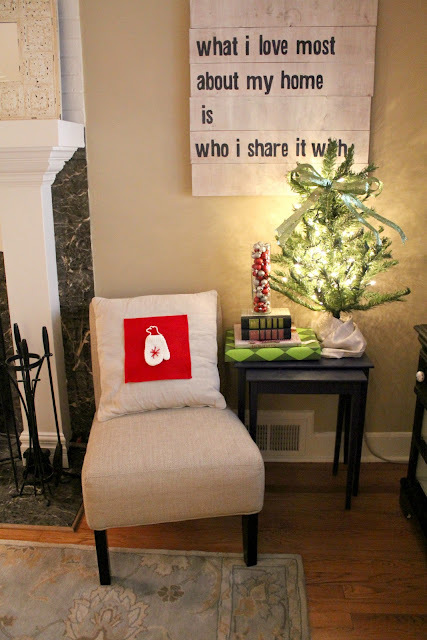 Over in the corner of the room, I set up a Christmas vignette with a tiny tree and DIY Christmas pillow. As you can see, we mainly only decorate the living room. I've got some greenery in the kitchen and a Santa or two scattered throughout the house, but I focus most of my attention in this room since we spend the most time in it. 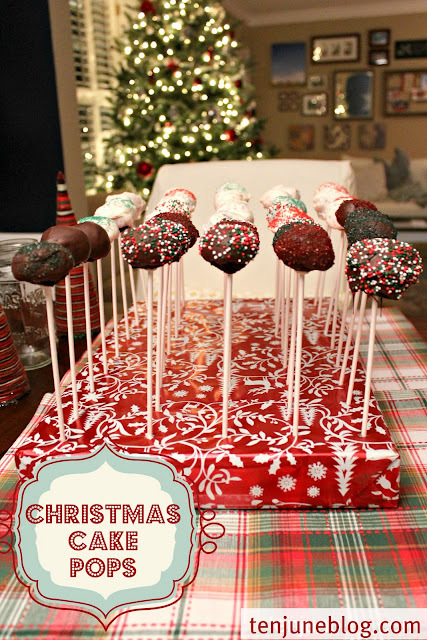 But don't forget some of the Christmas magic that was made over in the kitchen, in the form of Christmas cake pops! Yum. I also hung last year's yarn wreath in the kitchen on the door to our sunroom. I traded in the felt flowers for some sparkly red berries. Red + sparkle is the name of the game this season! So there you have it! Christmas here at Ten June. 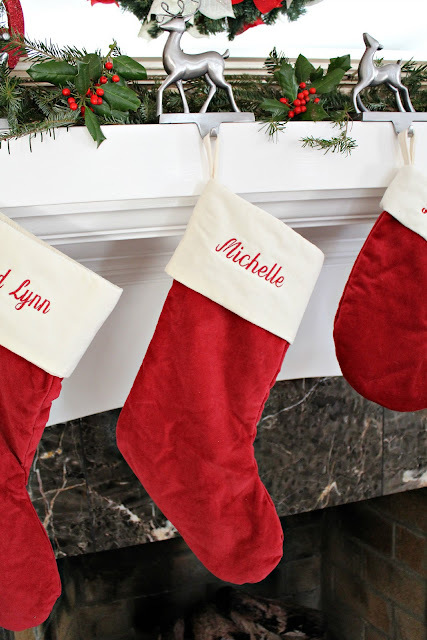 Now head on over and link up any and all of your Christmas decor over at Michaela Noelle Designs! 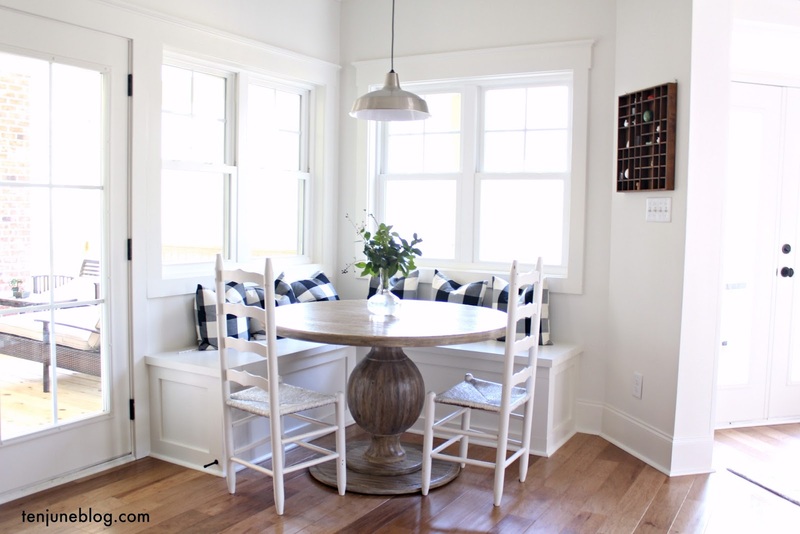 I'm also sharing this post with the Inspired Room, Nesting Place and Between Naps on the Porch! Loving all the red and white Michelle! And, I love how you've displayed your cards. so pretty! i love all those pops of red and the wreaths on the windows! 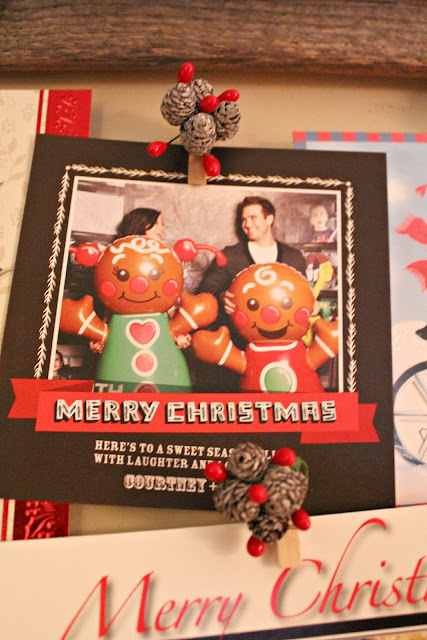 Love the christmas card holder- those clothespins are too cute! Definately doing the snowball garland next year! Looks beautiful! 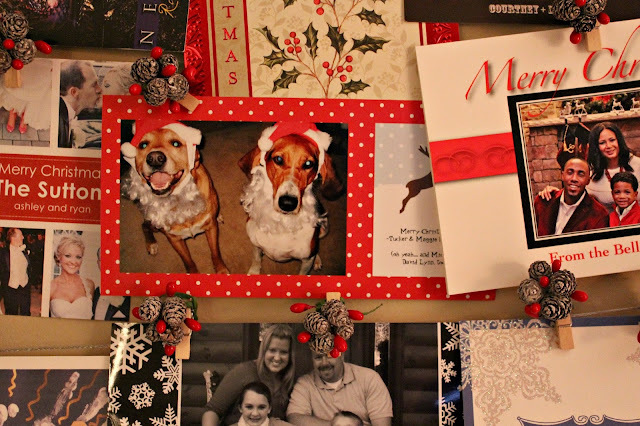 I love the wreaths outside and the Xmas card board!! Your home is just beautiful. So happy to meet you I have enjoyed looking around. 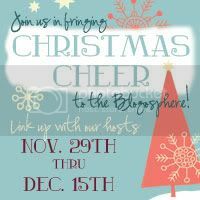 I have just found your lovely blog through the blog on Christmas cheer link wonderful to join in. I'm now following you hope you visit me sometime, follow back if you like so nice to find new friends to catch up with. Have a great day. i think the pompom garland is my favorite! as well as the wreaths outside the house! beautiful! I seriously can't get over how much I love your Christmas tree! It's so classic and beautiful! So pretty! I love all your decorations. =) They fit in so well with the decor you already have. The little sitting area is my favorite. So beautiful!! I love all the fun details. 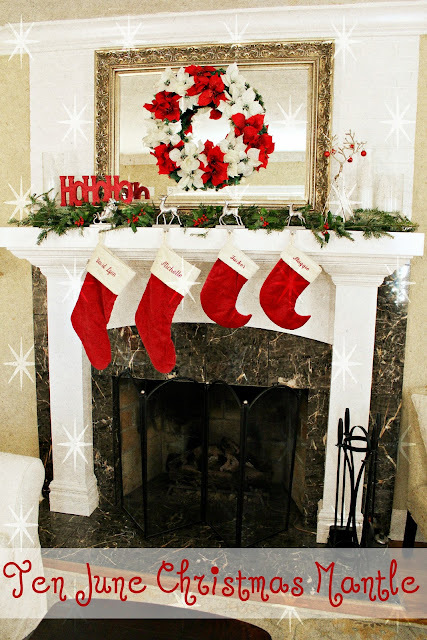 Your mantle really does shine this year! Love it!! What time can I come over? I agree with Michaela . 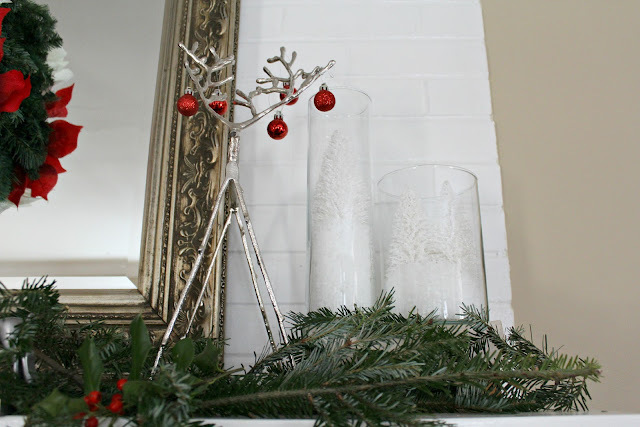 .your mantel is amazing. Really. And I love the gallery wall. 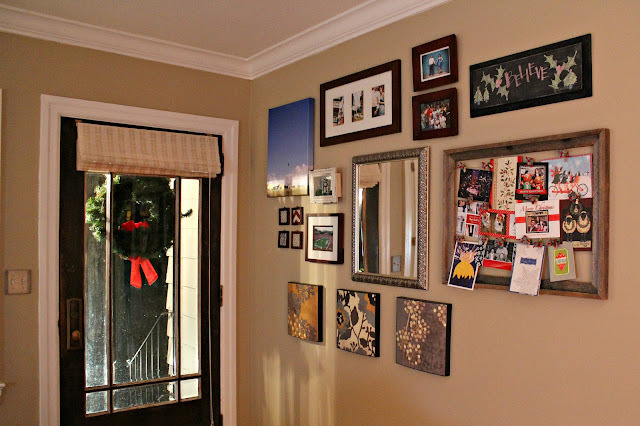 I am inspired to do a gallery wall on my stairs and be able to swap things out at Christmas time. Hope you are feeling a bit better. Love the wreaths on the exterior of the home! So pretty...it all looks amazing! Can't believe Christmas is 10 days aways!! 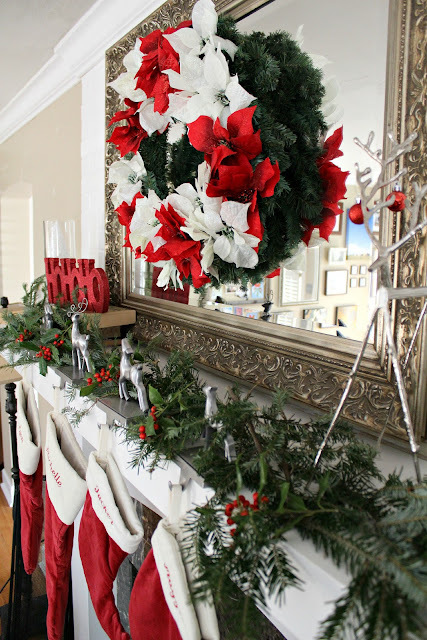 Your home looks gorgeous and Christmasy :) Love it! I love all of your decorations. They're all so classy! 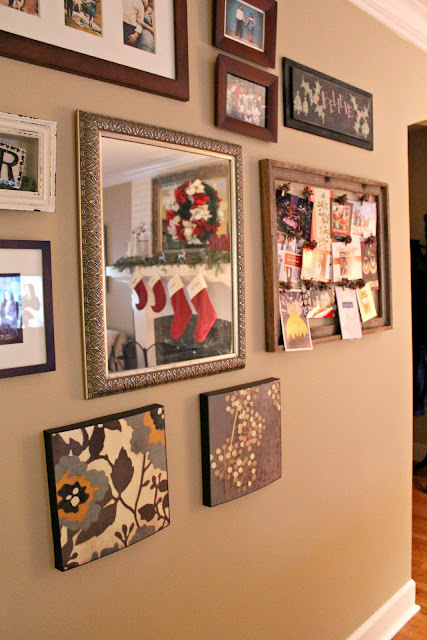 And that gallery wall, although not Christmas I realize, is amazing. There are only two gallery walls I've ever seen that make me want to put up a gallery wall, and this is one of them. Everything is beautiful! You've done a great job!